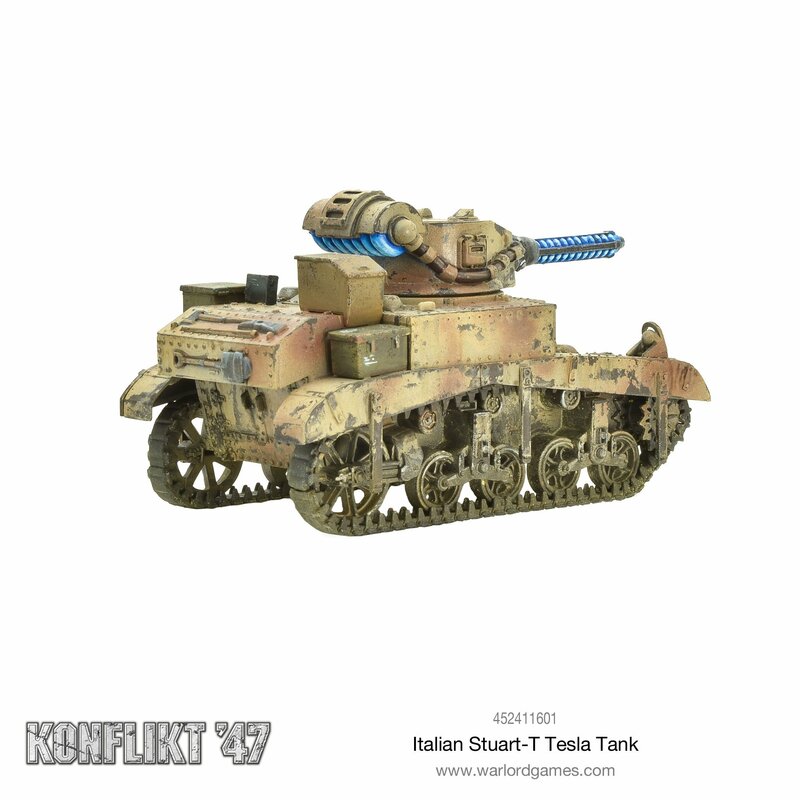 Wrlord Games spendieren den Italienern von Konflikt ’47 einen M3 Stuart mit der gefürchteten Teslakanone. 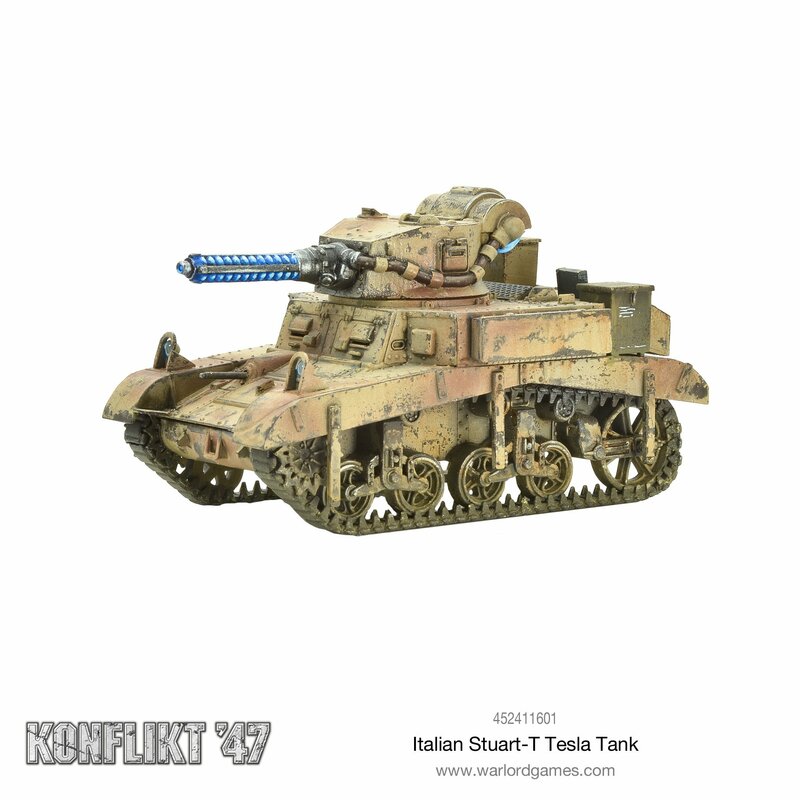 Italy’s demands for armoured vehicles was both passionate and excessive, but the Allies quickly recognised that if they were to release forces from Italy, they needed to arm the Italians. Numerous M3 Stuarts were available to transfer to Italy, and although no longer first-line tanks, they were reliable, fast and easy to maintain. 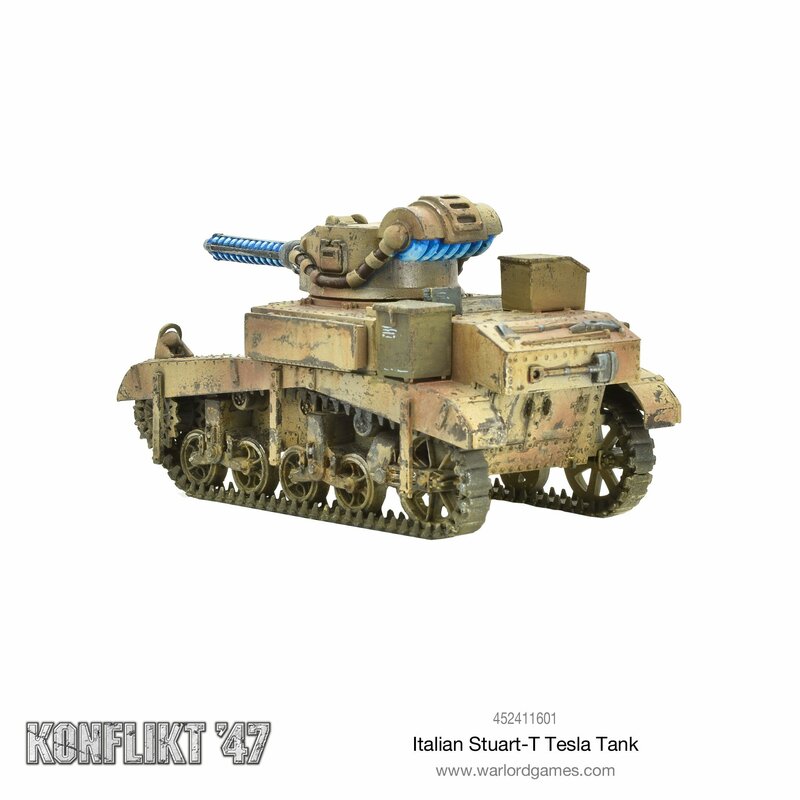 More importantly, with the reduction in the size of the lighter Rift-technology Tesla cannons, the Italians were able to modify the existing M3A1 turret to house the same light Tesla weapon as fitted to the US M8 Scout. The hull proved just large enough to house the necessary power and battery units, and the Italians found themselves with a fast, mobile light tank that packed a surprising punch for its size. 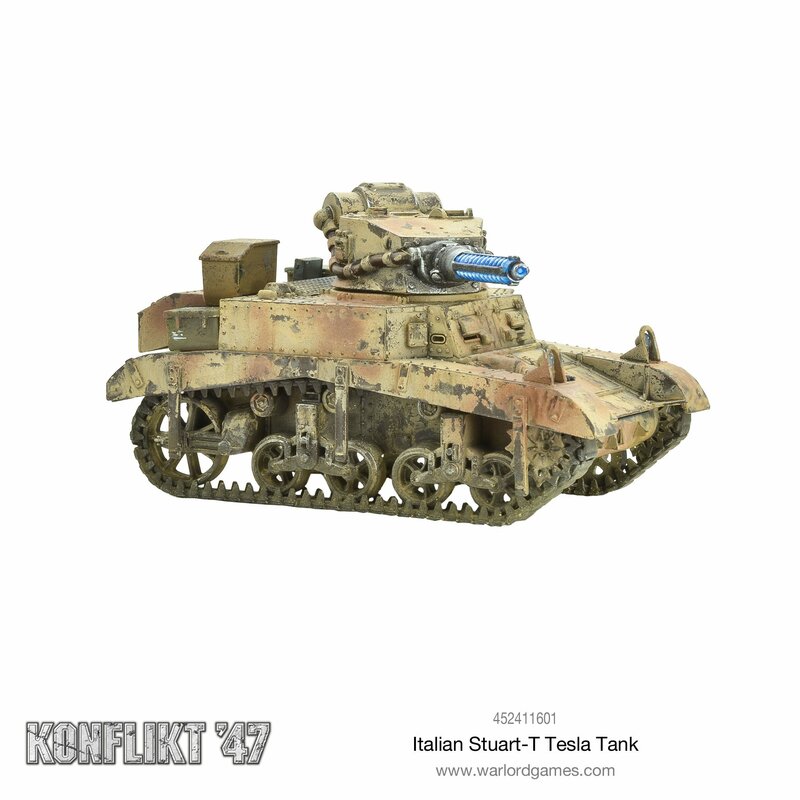 Although Italy does use conventional Stuart tanks for recce duties, the tanks fitted with Rift technology are more often used to provide close support to infantry units attacking in rough terrain or supporting heavier tanks on the flanks of an assault. 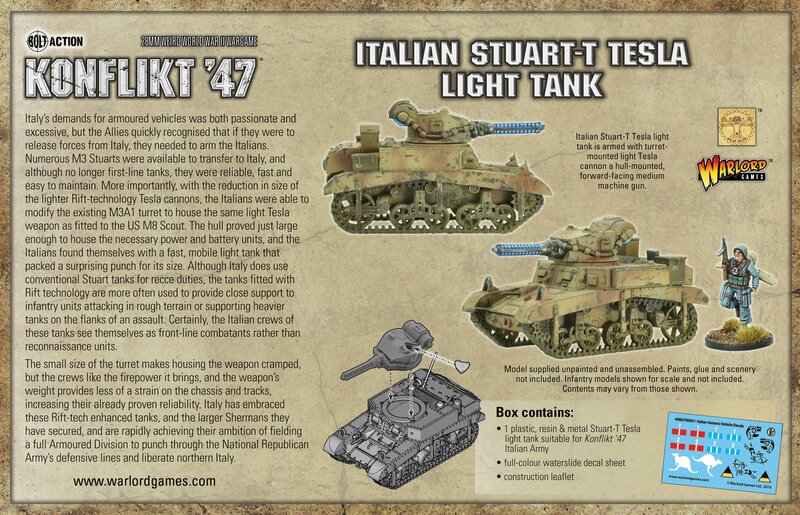 Certainly, the Italian crews of these tanks see themselves as front-line combatants rather than reconnaissance units. The small size of the turret makes housing the weapon cramped, but the crews like the firepower it brings, and the weapon’s weight provides less of a strain on the chassis and tracks, increasing their already proven reliability. 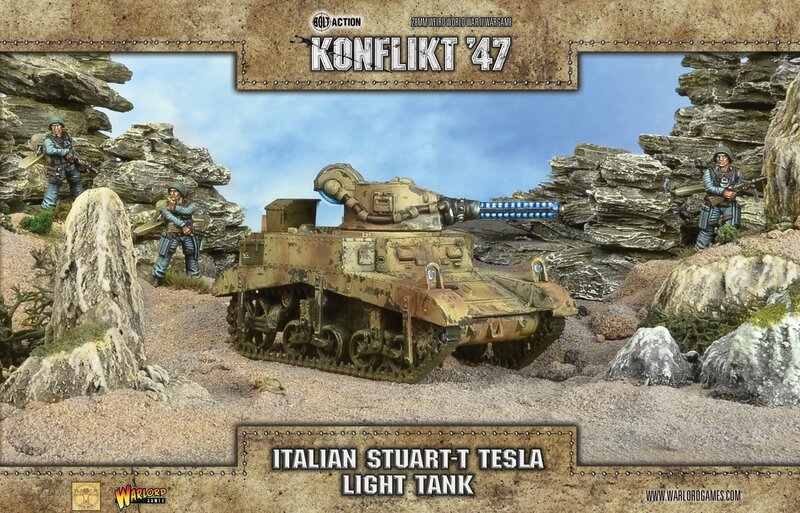 Italy has embraced these Rift-tech enhanced tanks, and the larger Shermans they have secured, and are rapidly achieving their ambition of fielding a full Armoured Division to punch through the National Republican ­­­­Army’s defensive lines and liberate northern Italy. 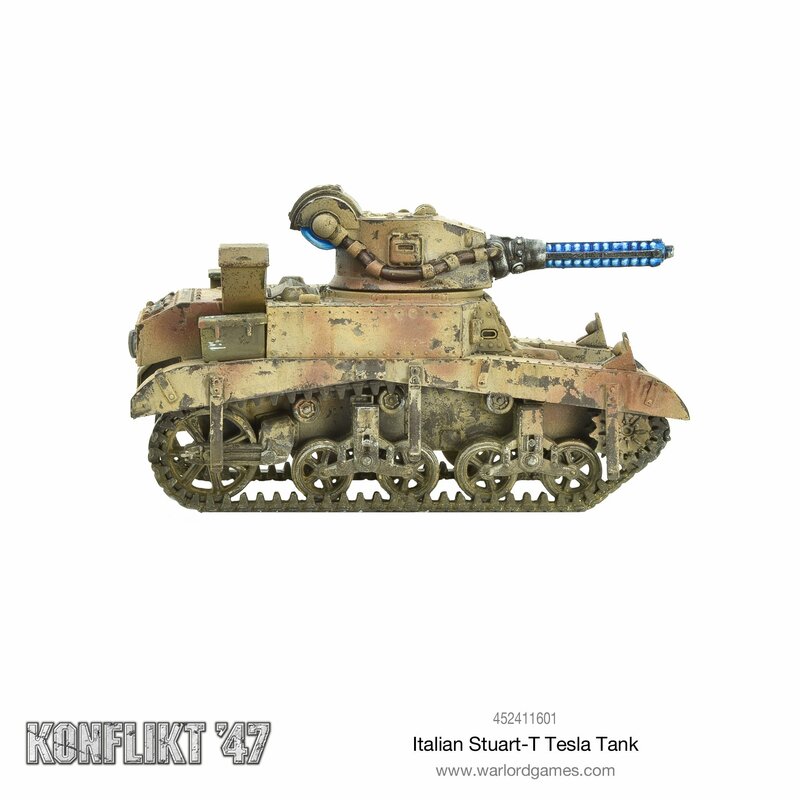 Italian Stuart-T Tesla light tank is armed with turret-mounted light Tesla cannon a hull-mounted, forward-facing medium machine gun. Kauft Dust Models die Grundmodelle für die Dust Reihe von anderen Herstellern eigentlich dazu, ich kann mir nicht vorstellen, dass sie allen „normalen“ Modelle aus Plastik selbst herstellen. 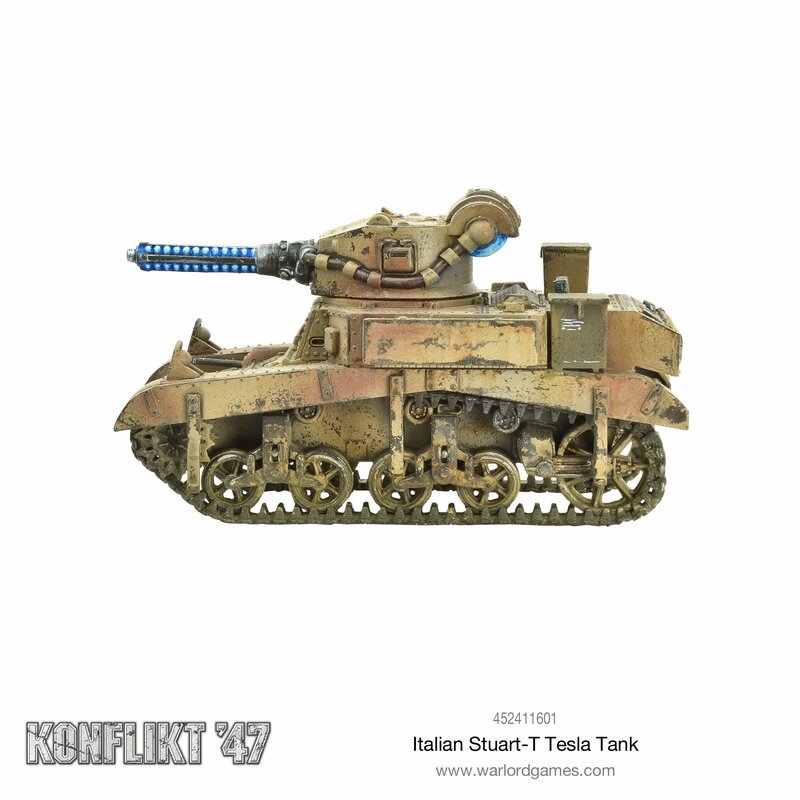 Wobei Warlord in der Tat bei einigen Plastikpanzern Italeri-Bausätze in 1/56 benutzt bzw. mit denen zusammenarbeitet (auf beiden Packungen sind die Logos der jeweils anderen Firma mit drauf). Aber mal außerhalb von Sonderaktionen unterscheidet sich das preislich nur wenig, da Warlord noch ein paar Kleinigkeiten wie die Schadensmarker dazu packt. Und gerade die sehen, so einfach sie auch gemacht sind, auf einem Spielfeld super schick aus wie ich vor kurzem bei einer großen Partie Konflikt ’47 feststellen durfte.